Seventeen-year-old Cassie Cee feels invisible because she's a double-digit size. She finds a book in a secondhand bookstore that she hopes will change her life. Her best friend's brother wants to make vlogs about how she is following the ten rules she found in the book, why she is doing it, and how she feels about being invisible for his school project. She agrees, but only if he promises no one but his college advisor will see the vlogs. He promises, but a friend of his posts them online and they go viral. When one of the "famous rules" puts her best friend, Rachel in a dangerous situation, Cassie makes one last vlog and Chuck posts it online. But emails begin arriving from other girls who have felt invisible, and she realizes she has to own up to being "the real Cassie Cee." It's been much too long since I've had the pleasure of reading a fun contemporary novel. How to Be Almost Famous in Ten Days, apart from being a mouthful of a title, was exactly the kind of entertaining read I wanted last weekend! Even though this story doesn't really linger over serious issues and unbelievable, I had a lot of fun joining Cassie and her friends for their summer adventure in Cassie's quest to become famous. If you're looking for something light and quick and just plain good ol' fun to read, this book would be perfect! Because of its short length, I was fairly certain I wouldn't get to really know the characters in this novel on an intimate level. That was a fairly accurate assumption, as the book really lingers mostly on a surface level with its characters. But there were a few moments here and there that proved insightful when it came to a character's true feelings and motivations. Even though I finished without feeling any lingering affection for the characters, I was able to connect with them for some moments, which is always a good thing. The story is really what provided bulk of the entertainment! 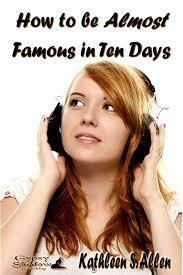 The basic premise - following a rule book in order to be famous in ten days - is already pretty intriguing. Watching what happens as a result was really fun (and sometimes emotional). There are a lot of zany, crazy things that happen to Cassie, her best friend Rachel and their friends. At times, things fell into place a little too conveniently, but I enjoyed it anyway since I just kind of wanted to roll with the story. Overall, it made me feel nostalgic for my days in high school when I would get up to crazy summer shenanigans with my own best friends, and I really liked that! It may not necessarily have the same sort of character development as other contemporary novels, but How to Be Almost Famous in Ten Days does not lack on the side of entertainment. It's a really fun and extra lively novel, filled with crazy antics and silly moments and a pretty darn awesome group of friends. I really enjoyed it, as it was just the break I needed from all my fantasy novels! As part of the blog tour, there's a giveaway! The prizes are a swag bag + ebook copy of the book. Nice review. Thanks for bringing this to my attention.